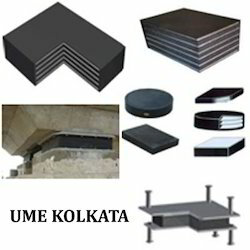 Universal Moulders & Engineers, Kolkata manufactures, supply and regular exports Bridge bearing Pads which are a commonly used modern bridge bearing. There are several different similar types of bridge bearings that include neoprene bearing pads, neoprene bridge bearings, laminated elastomeric bearings and seismic isolators which are all generally referred to as bridge bearing pads in the construction industry. Elastomeric bearings normally consist of a number of rubber layers separated by steel plates normally moulded in pads or strips and are ideally suited for small structures to accommodate movements by deformation shear and rotations. Elastomeric bearings provide an excellent economic solution for applications where structure movements, longitudinal, transverse and rotational are small, provide vibration isolation and are generally simple to install. Neoprene rubber laminated Elastomeric bearings are relatively maintenance free but will degrade over time and require replacement. Plain and laminated neoprene elastomeric bearings are manufactured by UME both in neoprene and natural rubber compounds confirming to AASHTO/ BS/EN /DIN standards. Bridge bearings and bridge bearing pads are manufactured in neoprene rubber compounds, unless otherwise specified for natural rubber compound. Our specialization is always in neoprene compound and bridge bearings, elastomeric, pads, high damping neoprene rubber bearings are manufactured from our years of experience, and with support from our technical partners for all requirements of neoprene bridge bearing, neoprene bridge bearings rubber bearing, steel bearing, pot bearing, guided bearing, for all bridge and building bearing applications. Elastomeric bearing pads compress on vertical load and accommodate horizontal rotation and provide lateral shear movement. Elastomeric bearing pads are the most economical solution used in construction of large span bridges and building. Bridge bearings are devices for transferring loads and movements from deck to piers. UME manufactures Laminated Neoprene Bridge Bearings and Laminate Elastomeric Bearings, PTFE Teflon sliding bearings. We at UME, manufacture neoprene bridge bearings, elastomeric, pads, high damping rubber bearing, expansion joints, PTFE sliding bearing, Sliding bearings Pads. The compounds comply with well-known international standards as MOPT, EN, BS, ASTM, AASHTO, etc. A range of hardness’s is available from 50 Shore A to 70 Shore A to suit special applications. Usage of Bearing Pads; A bridge basically consists of bridge deck supported by piers. In order to avoid damage by movements of thermal expansion, vehicular movement, loading to piers, bridge bearings are used to accommodate these movements so as to reduce reaction forces and bending movement to within safety limits of structure. Neoprene Rubber as well as Natural Rubber is an ideal engineering material for bridge bearings as it is highly elastic and sufficiently soft to accommodate these movements without transmitting harmful stress and also it absorbs and isolates energy from impacts and vibrations. 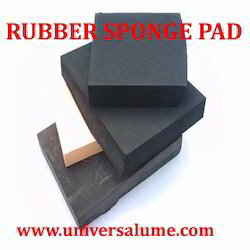 Universal Moulders Engineers manufacture, supply and exports infinite array of Rubber Pads and Sheets made from our extensive range of non-metallic materials. Pads can be made in both plain and self adhesive backed format with adhesive on one or multiple sides and made to virtually any given size. Looking for Elastomeric Bridge Bearing Pads ?